We have a SpiderBaby – and I’m not sure whether to be proud or just plain terrified. These days, the phrases I hear myself saying more often than any others are: ‘Be careful.’ ‘Don’t climb on that.’ and ‘Jesus! How did you get all the way up there? !’ As you may have figured, Mimi has taken the presence of any object in her path, a stool, a tree, or a traffic sign, as a challenge that needs to conquered. In the few seconds that it takes me to fetch a yoghurt from the fridge, she will have clambered up and be teetering precariously on the back of the couch. It seems that the higher the risk of serious injury, the greater the thrill for her. Anything near the sharp marble edges of the fireplace is an obstacle with bonus points in her adrenalin-addled mind! So my dilemma is this, I WANT her to take risks – I think it’s an essential part of childhood, to find out how far you can push yourself and your luck – but I’m afraid my blood pressure can’t handle it. Right from the start, we resolved not to raise a child who shied away from a challenge and in a world that more often encourages girls to be meek and reticent, we want her to be confident that she can do anything the boys can. We want her to be strong, capable, fierce.. but we also want her to survive to adulthood! 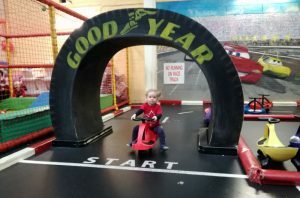 We were delighted then, to be invited to Playzone Celbridge for their parent and toddler morning activities. This seemed like the perfect answer to my quandary – a safe space in which Mimi could indulge her passion for life on the edge. A ten thousand square foot, fully-fledged, purpose-built toddler Thunderdome! Time to get crazy! PETROLHEAD: Mimi gets her competitive drive on in the roller racer cars. The pair of us hadn’t been in the door five seconds before I, and my ‘safety-first’ attitude, were ditched. On first sight of the thrills and spills available, Mimi took to her heels and I had to pursue at pace. The baby play frame with its padded climbing area and short slide into a multicoloured ball pit were her first port of call, where she probably set a new record for lap times, barrelling around like a pigtailed pinball with a huge grin on her mug. And I, watching through the safety netting, allowed myself to relax – the jeopardy factor at last negated. Wide-eyed and breathless, Mimi emerged from the play frame only to leg it to the next attraction – the roller racer track. Here, things started to get competitive. Leaping onto the four-wheeled roller car like a bank job getaway, she was off hurtling around the track as fast as her wee legs could carry her. This discipline is much more like a demolition derby than Formula One, especially when Mimi decided that she wanted to drive in the opposite direction to all the other toddlers. But the smart design of the cars meant that even when the inevitable collisions occurred, all the tiny drivers emerged unscathed and quite delighted with themselves. Just when I thought she might spend the whole three-hour session on the track, Mimi caught sight of her Everest – the giant toddler play frame. Over three levels, with swings, a ball zipline, hanging padded bags and gates, and an enormous slide, she had found her nirvana. At first, I let her at it and considered parking myself in the large cafe/viewing area to re-caffeinate but decided that she shouldn’t have ALL the fun and joined her in exploring the play frame. Even for a forty-something auld fella this was the craic, but chasing a smaller, more agile, more energetic quarry for that length of time made me decide I’d now earned that coffee.I had hoped a respite for juice and snacks might chill little Spidey out a bit.. some chance, once refuelled she was back at it and I gave up hope of keeping up. Surprisingly, for an adrenaline junkie, it was the option to get messy with some homemade playdoh that got Mimi to sit for more than ten seconds. Ably assisted by Kasia, Playzone’s fantastic Parent & Toddler Coordinator, she was soon engrossed in making ‘cakes’ that got jammed into a play oven before, Mrs Doyle style, she insisted I sample one – bleh! !When it came time to depart, the farewell was bitter. “But Dada, it’s too much fun here. It’s no fun at my house.” Harsh criticism of my efforts to entertain, but in comparison, probably true. Three and a half hours of frolics simply flew by at Playzone Celbridge and we only extricated ourselves with a promise of a return visit very soon. This indulgence of her penchant for anti-gravity activities hasn’t stopped her giving me palpitations at home, by the way, but at least she’s had some practice now. If she’s going to grow into the fearless athlete I hope she will, then at least there’s somewhere we can go where I don’t have to curb her enthusiasm. It’s either that, or convert the entire house into a ball pit, which I don’t think her mum will go for. Previous Post GIVIN’ ME DADDITUDE: Perceptions of stay-home fatherhood. Next Post DadVinci: A Scientologist’s dream.